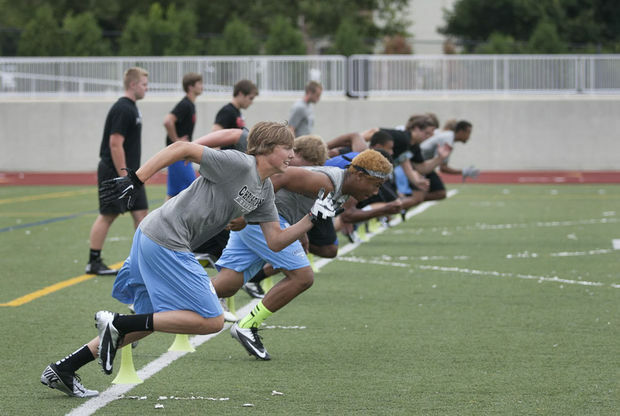 2014 Summer Football Showcase arrives in St. Joe on July 23rd! The Lake’s expert scouting staff will be on-hand at St. Joe to chronicle breakout performers and top prospects for converge on LakeMichiganFootballReport.com. ALL testing results will be made available to Division I, II, III & NAIA college coaches. The Lake Michigan Football Report has built strong relationships with college coaches in the MIAA, GLIAC, Missouri Valley, Ivy League, MAC, ACC, Big Ten, Big East, SEC, PAC-12, Big 12, and the University of Notre Dame! Numerous “undiscovered” football players who have attended Lake Michigan Football Report events have earned college scholarships to play football at the next level. Wednesday, July 23rd, 2014 at St. Joseph High School (St. Joseph, MI). Registration begins at 6:30 PM. Players will take the field at 7:00 PM. Information about the stadium can be found here. Online registration ($65 + $3 online convenience fee) has now closed. Walk-up registration will be available on the day of each event for $75. Are you guys going to make it to Cheboygan this year?